After these past few games of utter disappointment, the trade rumors are at a boiling point for the Brewers organization. Teams have already started calling Doug Melvin and Co. about multiple players, which I will list and talk about below. Please note that these are all either rumors and/or my speculations. None of this is set in stone. 10. Shaun Marcum - Marcum would be much higher on my list if he were not on the disabled list. Pre-DL, talks of us moving Marcum were just about as popular as moving Greinke. I don't really see any team wanting Marcum at this point. So, unless Marcum has a great outing before the trade deadline, it's pretty safe to say he'll stay on the Brewers. Still, worth noting that teams were/are interested. 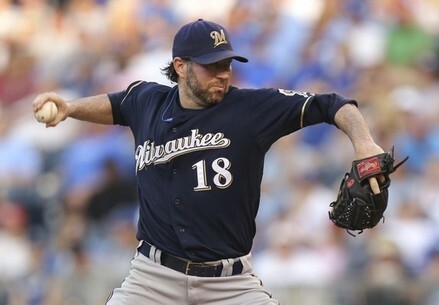 Ideally, retaining Marcum (if healthy) would be the Brewers best bet if we can't move him at the trade deadline. 9. Nyjer Morgan - Kind of the same deal with Marcum. Had Nyjer had a season like his last in 2011, he probably would be higher on this list. But, he just hasn't put up the numbers as he did last year. His starts are down, in favor of Carlos Gomez and Norichika Aoki. He has struck out a lot more, bringing his batting average down from last year. If he could have out performed his stats last season, we might have seen Morgan take the trip to the Yankees, rather Ichiro going there. 8. Randy Wolf - Any team looking for a veteran pitcher for the postseason should give Randy Wolf a legitimate look. His first innings are usually rough, but after that he has been pretty good. He works batters into hitting a lot of ground outs and fly outs. On occasion, he even strikes a few out. Our bullpen has misconstrued Randy's win total, blowing 11 leads for Wolf this season, and it's only July. 7. Kameron Loe - I know what you're thinking. "Who the hell would want him?" Well, we've already received a call or two on him, to much of our surprise. Realistically, it makes sense for a team that just needs depth for their bullpen would want a guy like Loe. He wouldn't be their main reliever. As long as he doesn't hang pitches like he does for us, he's a good pick up for a contending team. 6. Travis Ishikawa - He would strictly go to a team looking for a big left handed bat off the bench to pinch hit, possibly DH or play 1st base or outfield. He's very versatile. We wouldn't get much for him, but no one expects to get a top prospect for a guy like Travis, who is very inconsistent as a pinch hitter. 5. Corey Hart -Unlikely we trade him, unless he goes with a Greinke trade to tempt teams to send top prospects. Hart is a very valuable component to our team, and it would sting a bit to see him go, especially now since we've seen him emerge as a very valuable 1st baseman. His bat has always been streaky, and any team going after him know this. Any team looking for an extra bat in their line-up will be calling. Note: (Updated 7/27) The rumors have begun to swirl. As I'll explain more below in Zack Greinke's section, Corey Hart is rumored to be involved in talks that would send him in a package deal to Texas with Zack and minor league pitcher Martin Perez for Elvis Andrus and a second player, according to @BrewerNation. The sting would linger for a while losing Hart, especially since his emergence at 1st base has been gold glove worthy. 4. Carlos Gomez - Up until these past few games, Gomez really doesn't even make this list. However, hitting home runs off of Cliff Lee and Roy Halladay changes people's perspectives. With guys like Logan Schafer in our minors, you've got to assume management would be okay with a guy like Gomez or Morgan (see above) on their way out. 3. George Kottaras -With the way Maldonado has been playing so well, and Lucroy on his way back very soon, it's hard to imagine that we wouldn't try to move Kottaras. A lot of teams have lost their catchers this year, or are just in need of a decent back-up. He can provide an offense a little pop in the 7, 8, or 9th spot. He could also DH in the American League. Note: (Updated 7/26) George Kottaras has been DFA'd, which gives the Brewers 10 days to either trade him, send him back to the 40 man roster, or release him. I'd say a trade is in the works. In retrospect, Toronto just lost J.P. Arensibia for 4-6 weeks with a broken hand. Toronto has a few relief pitchers that Milwaukee could be interested in. Toronto seems to me a lead candidate for George in my eyes. 2. Fransisco Rodriguez -The 30 pitches of terror needs to go. I'm sorry to those who like him, but he's not the same pitcher as last season. Any team looking for an arm in the bullpen to be their closer for the remainder of the season would want him, except they don't want his contract. His control has been off as well this season. He'd only go to a contender, but we'll be lucky to trade him to anyone. Some teams are that desperate, though. 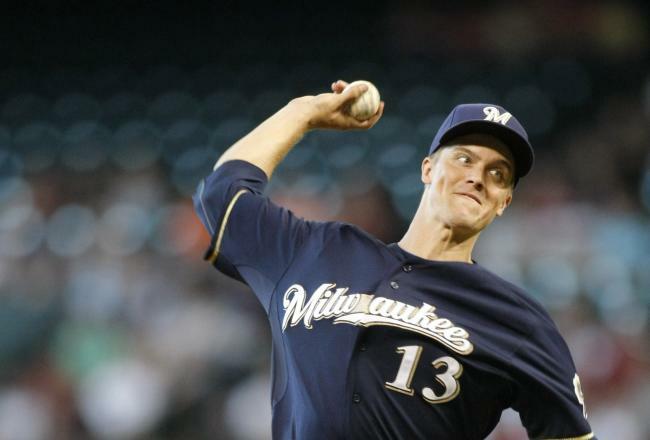 Have we witnessed the last start of Zack Greinke's Brewers tenure? Guys that didn't make this list, but could very well be moved include Cody Ransom, Cesar Izturis, John Axford, and Manny Parra. First off, I don't think we will move Axford, but I know we will receive calls on him. It's very possible we would look to move Izturis or Ransom to a team who is looking for middle infield depth. As for Parra, ignoring his past two appearances, he has been very dominant as of late. He's a decent lefty that could be a key puzzle piece to a contending bullpen. Nonetheless, no matter what happens between now and July 31st, it's going to be a fun, eventful ride. Enjoy, Brewer Nation. Note: (Updated 7/25) I realize that I didn't include Aramis Ramirez, as many of you have brought it to my attention on Twitter. I know I didn't include him, and I have reasons. I simply don't see us trading him. Market is kind of low for 3rd base, unless you look at the Dodgers (acquired Hanley Ramirez last night from Marlins) or Giants. Now, if Giants offer Brandon Belt for Ramirez, the Brewers better dot the i's and cross the t's on that trade. That would be a steal. But again, I just don't see it happening.